“Producer: I’d like to make her look a little more attractive, how far can you pull back? I mean, look at them – I almost didn’t post because I was worried that their Plain-Janeness would put you off from making them. But don’t – they are SO good and so, so easy. And mystifyingly gluten-free. I say “mystifyingly” (is that even a word?) because I don’t know how the perfect crispy-outside-chewy-inside texture is achieved without a speck of flour. Or butter, for that matter. As you may recall, I have not baked with peanut butter for many years now, due to Noah’s peanut allergy. There’s always a jar or two in the house because Mike, Conor and Chelsea (when she’s home) all eat it, and we are lucky that Noah’s allergy is not severe – he can be around peanut butter, he just can’t eat it. But I’ve pretty much drawn the line at baking with it because I don’t want to have to tell him that he can’t have something I’ve baked – and for the most part it hasn’t been an issue for me. And then I made these treats. And then these. And I forgot how much I love peanut butter too. 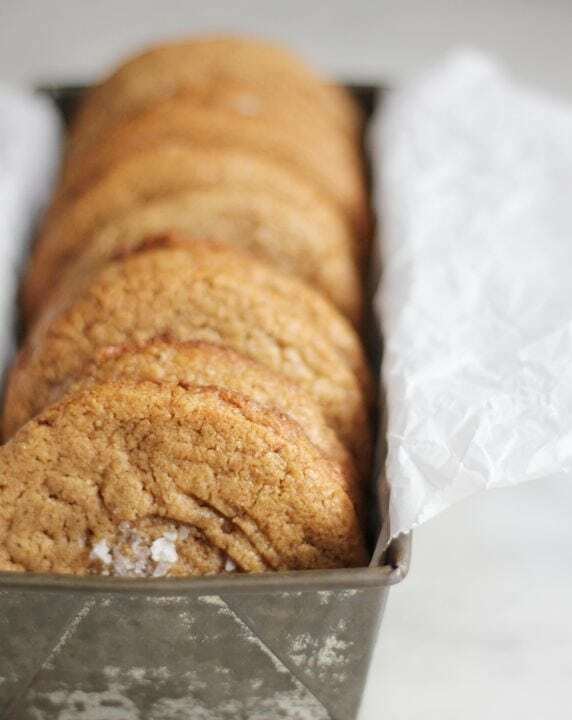 So when I came across this recipe over at Smitten Kitchen recently, it was almost too much – I mean, they looked DELICIOUS. And with just a few simple ingredients I knew you guys would love them too. I decided that I’d go for it and just keep them out of Noah’s reach. But THEN I thought – well, it’s pretty much a given that these are going to be a winner – what, with the peanut butter, brown sugar, etc. BUT – would they be just as good with a substitute? And if so, wouldn’t it be better to share THAT with you? So that’s what I did, using some almond butter that I had on-hand. You guys – so, so, SO GOOD! 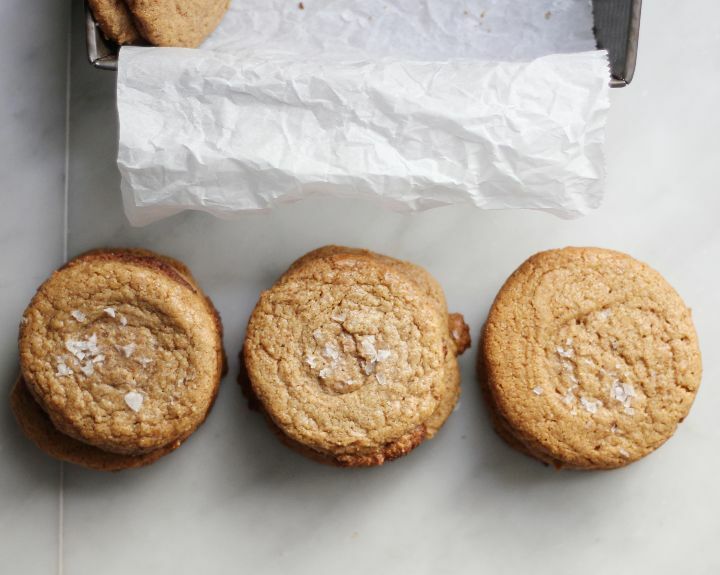 I am totally bookmarking these for Passover, and am thrilled to have a genuinely delicious, flourless, nut-butter cookie in my arsenal. How about you? Let me know if you try these, and what you think – especially if you use another nut (or sunflower) butter! Pre-heat oven to 350 – line a baking sheet with parchment paper. In a medium bowl whisk the brown sugar, eggs and vanilla. Whisk in the almond butter till completely blended (I found it helpful to use a rubber spatula toward the end). Pop the bowl in the freezer for 15 minutes, giving it a stir half-way through. Using a 1/4 cup measure, an ice cream scoop or a cookie scoop (I used this; Deb used this size), scoop the dough onto your prepared baking sheet. Freeze for at least 15 minutes (or longer, if you like). 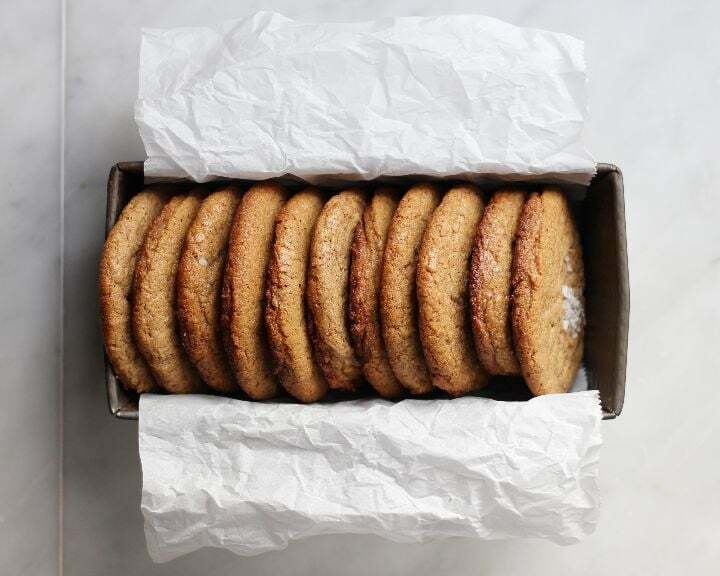 Sprinkle with your sea salt and place in the oven for 15-20 minutes (depending on the size of your cookies). They should look golden at the edges. Place the tray on a wire cooling rack for a minute or so and then transfer the cookies to the rack to cool completely. 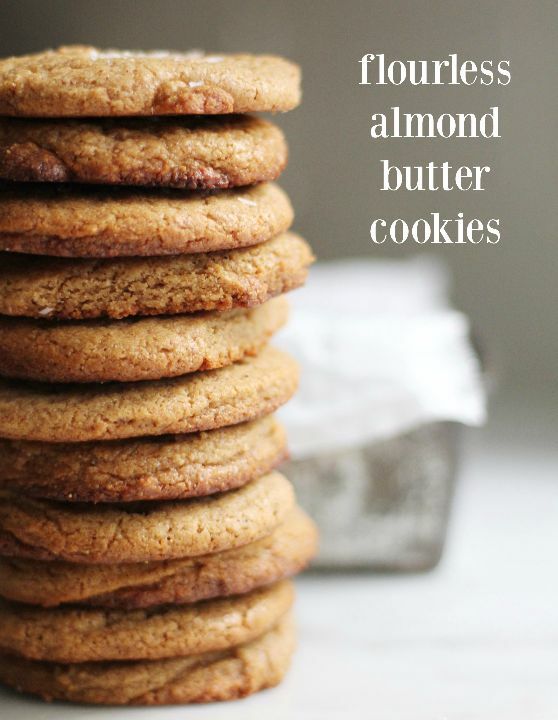 Note: The first time I made these I did not check my jar of almond butter – which contains no salt. Big mistake. Big. Huge (what movie?). A healthy pinch of kosher salt added to the batter fixed this right up. 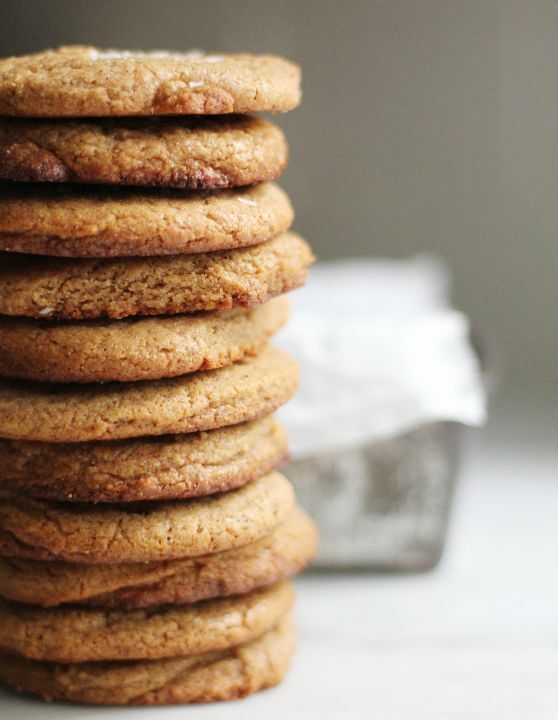 Check out my Pinterest board for all the cookies!